A fine copy in attractive recent binding, with numerous anecdotes and 136 illustrations. There are few pastimes that provide their followers with more innocent merriment than is afforded by “the royal and ancient”. It may be taken that there is no better way of reducing a man’s self-conceit than to place him on the teeing ground for the first time, present him with a driver and invite him to strike a little rubber-cored ball to a distance of 200 yards in a given direction. Consequently we have here most excellent material for fun; and you may depend upon it MR. PUNCH has not had his eyes long shut to the humours of the links. Signed in 1929 by Glenna Collett when she was in Pinehurst, North Carolina, to win her fifth Women's North & South Amateur Championship in eight years. She won again the following year for the sixth and final time. 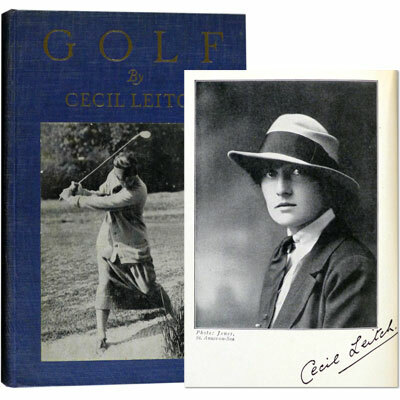 A fine autobiography by the dominant American female golfer of the first half of the 20th century, nicknamed the female Bobby Jones, as much for her composure and sportsmanship as for her astonishing achievements. Full of lively anecdotes and opinions, numerous photographs on 27 plates. With a foreword by Bobby Jones. ‘Glenna Collett Vare (1903-1989) won six U.S., two Canadian, and one French Women's Amateur Championships. In her day there was no professional women's tour. The LPGA’s Vare trophy, given to the player with the lowest scoring average, is awarded in her honour.’ - World Golf Hall of Fame. ‘Glenna was the first woman to attack the hole rather than just to play to the green’ - Former USGA president Richard Tufts. Golf - The Badminton Library of Sports and Pastimes. - Horace G. Hutchinson (Duke of Beaufort, Editor; Assisted by Alfred E.T. Watson). ‘One of the great books of the sport and deserves an honoured spot in every golf library.’ - Joseph Murdoch, The Library of Golf. An unusually bright sharp and mostly uncut copy, in a fine custom clamshell case with tipped-on Vanity Fair colour print of the flamboyant Horace Hutchinson himself. Covering the history of golf, celebrated golfers and celebrated links, styles, etiquette, giving odds, and, I assume, relevant for the day - ‘hints to cricketers who are taking up golf’. Illustrated by Thomas Hodge and Harry Furniss with 22 plates, several woodcuts in text, and many further illustrations. An interesting and broad ranging collection of articles on how to play golf by turn of the century highly respected writes and players such as Bernard Darwin, and May Hezlet. Illustrated throughout with 66 early black and white photographs. Scarce in the original bright pictorial boards, clearly demonstrating how fashion on the links is no longer what it used to be. In five parts - How to Learn; Elementary Instruction; From the Professional’s Point of View; Men of Genius; and From the Ladies Point of View. 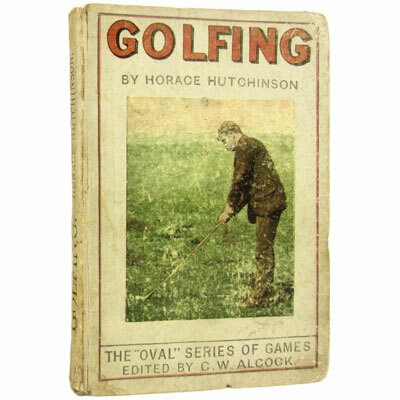 A rather scarce first edition of this early golfing title, in the original pictorial paper boards, without restoration or rebinding. By the great Horace Hutchinson, an accomplished golfer who won the first two official British Amateur Championships in 1886 and 1887, and he was also a writer of considerable skill. Illustrated with three black and white photographic plates. A neatly presented first edition by ‘one of golf’s first true Renaissance men – two-time Open champion, golf equipment maker, golf writer and one of the world’s best golf course architects’ [World Golf Hall of Fame]. Profusely illustrated with full page plates and in-text, from photographs and wood engravings.